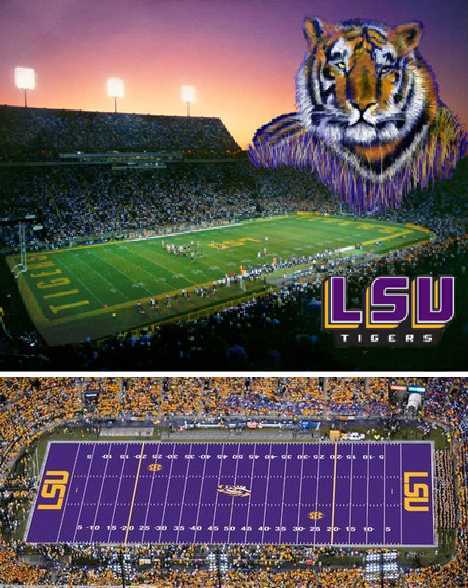 Want some artificial color with your synthetic stadium turf? Be careful what you wish for: Turf the color of surf is now a reality at many U.S. schools and the possibilities are mind-boggling… or at least, eye-boggling. 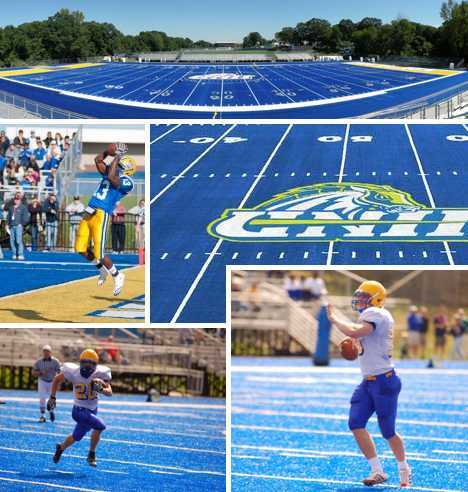 These 10 colorful football fields and turf tint concepts prove conclusively the grass isn’t always greener on the other side; sometimes it isn’t even green! 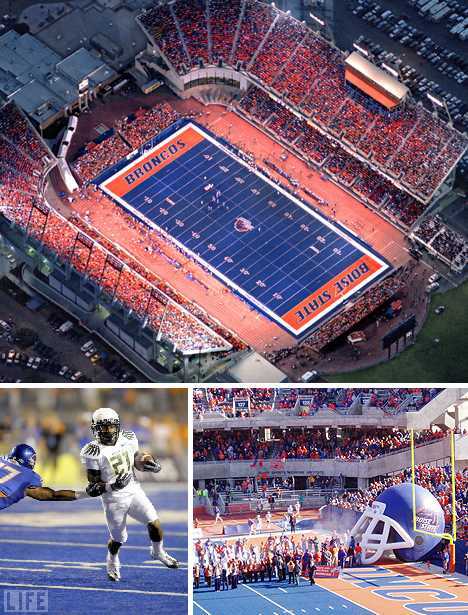 The famous “Smurf Turf” at Boise State University’s Bronco Stadium is much more than an experiment: since its debut in 1986 the rich blue stadium turf has been replaced twice, most recently in 2002. Not only is the playing field turf a rich shade of summer sky blue, it’s highlighted by contrasting orange turf in the end zones and orange trim on the white field numbers. Sacre bleu! 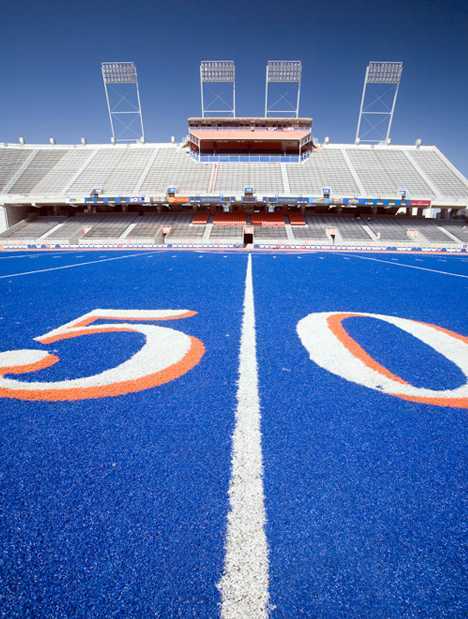 Blue sky above, blue turf below, and blue-uniformed players trying not to blow the game – just another day at Bronco Stadium. 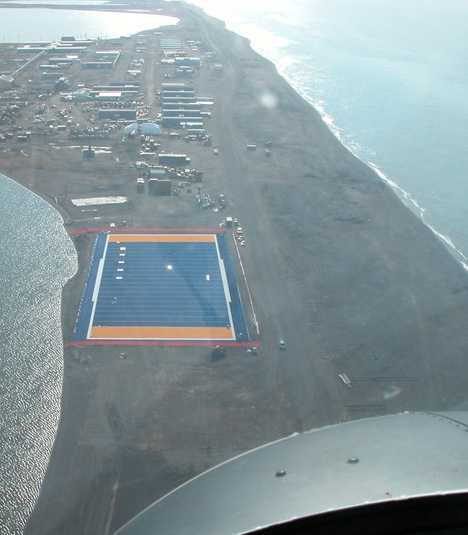 The once-unique blue turf has sparked a number of rumors over the past quarter century, including a story that migrating ducks were diving into the turf after mistaking the blue expanse for the surface of a pond. 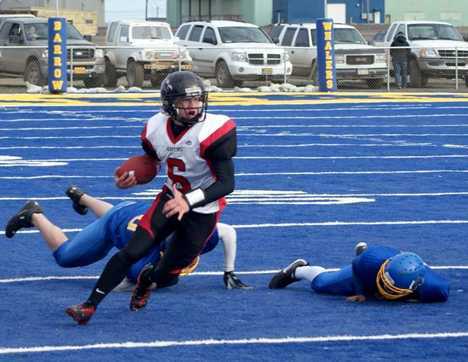 Timbuk 3 once sang, “The future’s so bright, I gotta wear shades.” Little did they know the future referred to the scarlet hue of the new turf at Canyon High School’s Cougar Stadium. 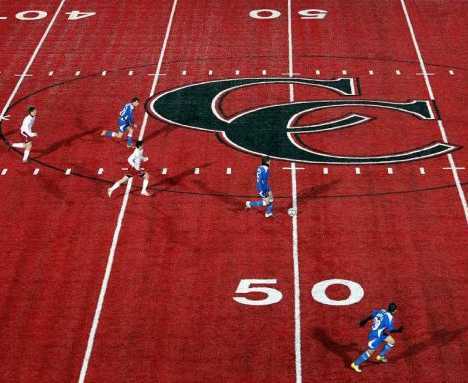 Said to be the first and only high school in the country with a red turf field, the combination football/soccer surface features white hash marks, black end zones and the Canyon High School “CC” logo in black, white and red right on the fifty yard line. 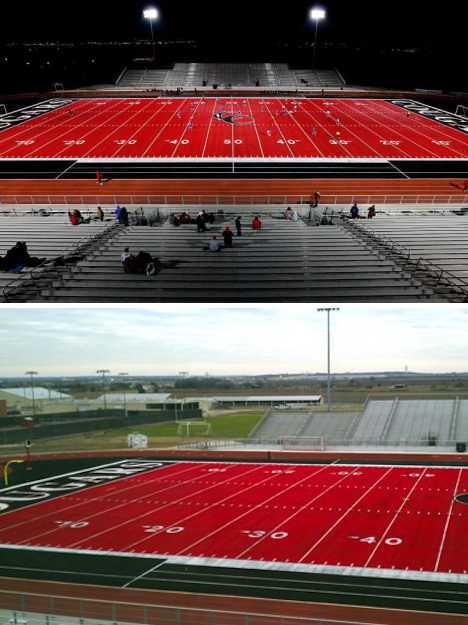 Teams playing in New Braunfels at Cougar Stadium for the first time can be forgiven for feeling a mite disoriented when they step onto a field where every zone is a red zone. The odd “Martian grass” didn’t seem to be a problem for teams breaking in the new turf during the 3-day Comal Cup soccer tournament, however. One question: if the ref throws a red card, will anyone besides him know? Persistent rumors making the rounds in the blogosphere insist a lurid change is in the works for the Alamodome in San Antonio, Texas, where the UTSA Roadrunners play. UTSA promotions ace Jim Goodman seems to be enjoying the free publicity discussions of a turf tint tinkering, saying only “We can neither confirm nor deny that we would have an orange field.” Seems like he’s doing both in the same sentence. 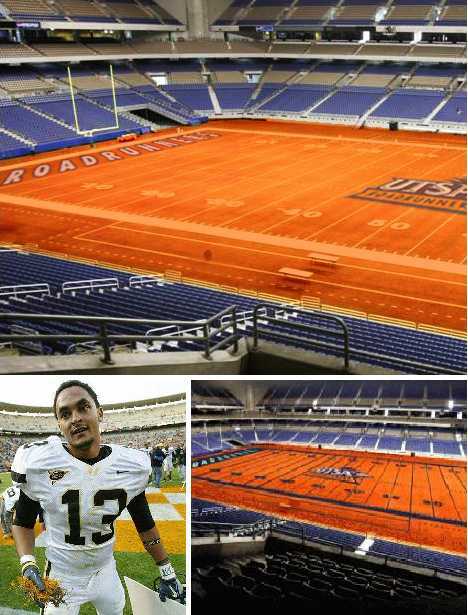 While orange turf is perfectly legal under current NCAA rules, adding blue lines and numbers as another photoshop rendering suggested is definitely not – for which we should all be thankful. 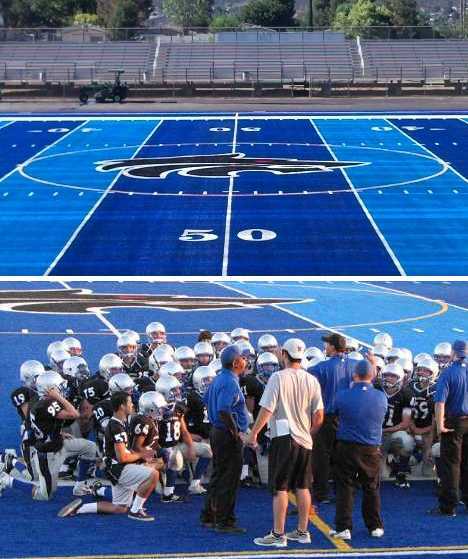 West Hills High School in Santee, near San Diego, didn’t think laying down blue turf for their new sports stadium was unique enough, it seems. Deciding to alternate light and dark shades of blue solved that issue. 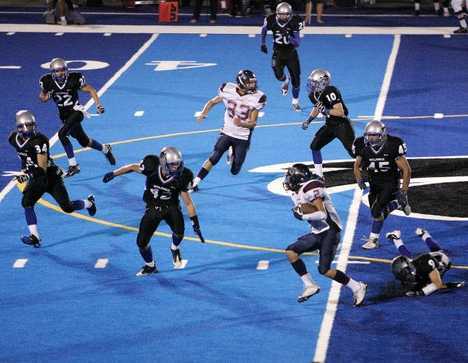 Indeed, the West Hills Wolf Pack now plays on the nation’s only non-green, two-tone turf field. Howl about that? Coach Ron Boehmke of the rival Steele Canyon Cougars doesn’t share Keeley’s blue mood, however. “It’s blue,” sneered Boehmke. “It is blue. I’m just glad we don’t have to practice on it every day. Bad enough we have to come over here and play on it. If I had to practice on it, it would drive me bonkers. 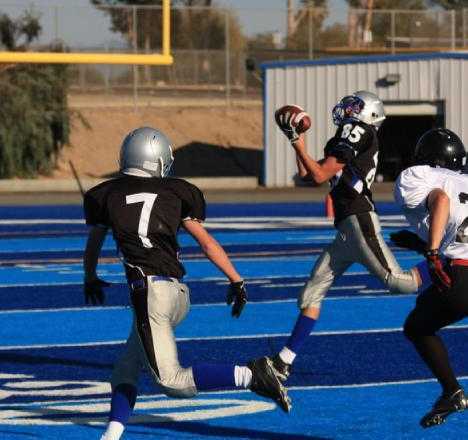 I just figured West Hills didn’t have a pool, so they killed two birds with one stone.” Haters gonna hate… and Boehmke’s Cougars spoiled West Hills’ 2009 home opener by dumping – or maybe a better word is dunking – the Wolf Pack by a score of 48 to 28. 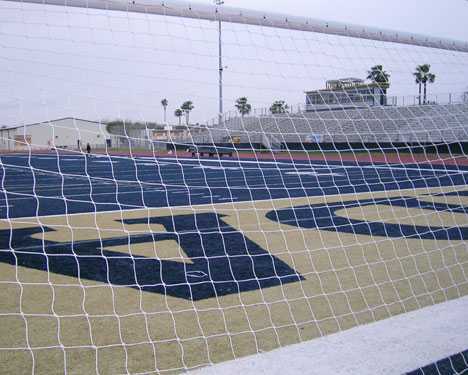 Bill Pate Stadium, home of the Hidalgo High School Pirates of Hidalgo, Texas, opened in 1981 but a recent renovation employing blue artificial turf has put the school at the forefront of sports field design. 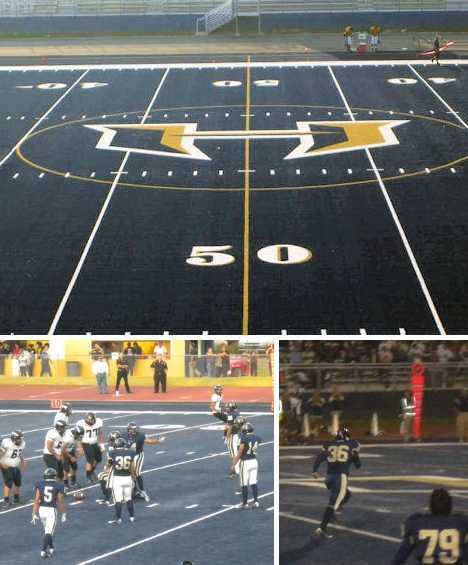 Unlike other blue turf fields, Hidalgo’s is of a darker, more subtle shade that is complemented by white and pale gold trim. It may not be Kentucky Bluegrass but Hidalgo’s blue turf at least tries not to draw too much attention to itself. This more naturalistic turf hue shows rare restraint in stadium design while undoubtedly soothing the eyes of players and spectators alike. Purple turf? 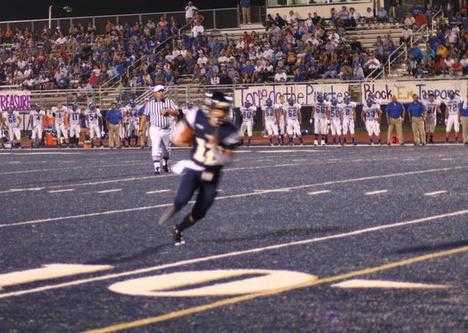 In MY Tiger Stadium? You must be joking… and that’s exactly what LSUsports.net. “The Official Website for LSU Athletics”, had in mind on April 1st, 2010 – note that date. The alluringly lurid faux-photo of Tiger Stadium’s field cloaked in majestic purple with gold trim looks eminently doable, even more so after a few beers. Anyone not in on the fun merely had to refer to the copy, which stated that “The turf will be installed by Turfus and Sons, a subsidiary of Vandalay Industries, which is the largest producer of the rubber material found underneath dangerous playground equipment. ‘Partnering with LSU just makes sense,’ said Art Vandalay, President and CEO of Vandalay Industries.” Hmm, I always thought he was a latex importer/exporter. 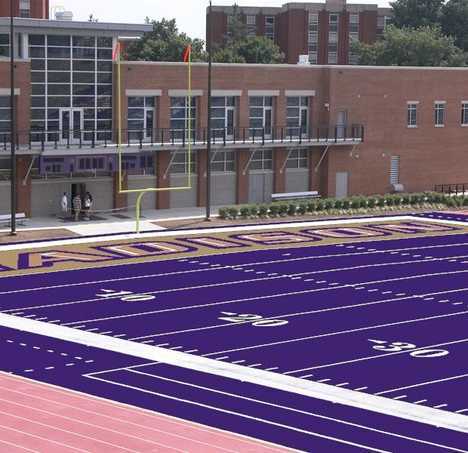 The concept for a purple turf field shown above is being promoted by Purple Turf for JMU, a Facebook group with (at press time) over 2,600 members. Their goal: to convince the administrators of James Madison University in Harrisonburg, VA, to lay down royal purple turf at the school’s new stadium. Seems more than appropriate for a team called the Dukes, amiright? 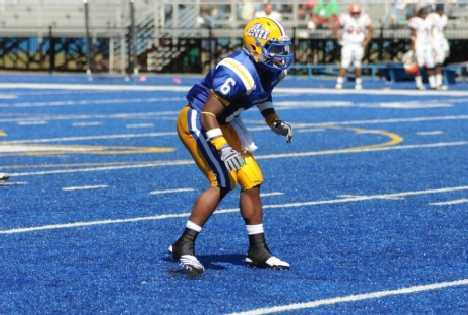 In September of 2008, the University of New Haven put the finishing touches on the new, blue turf field at Ralph F. DellaCamera Jr. Stadium. The refurbishment was in preparation for the return of the UNH football program and coinciding membership in the NCAA’s Northeast-10 Conference. The UNH Chargers now play on a medium blue turf field with un-trimmed white numerals and lines. UNH’s athletic department isn’t shy about the reasons behind their opting for blue turf. “Absolutely, we’re making a statement,” says Debbie Chin, athletic director at UNH. 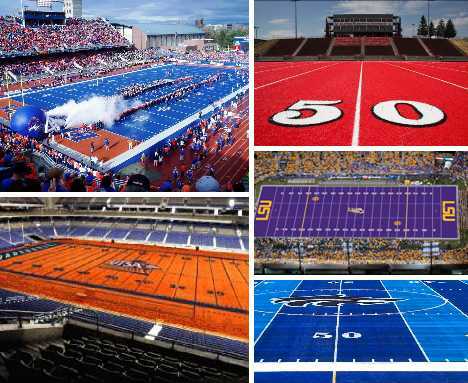 “We’re bringing football back and we’re doing it the right way.” Not according to Boise State students and alumni, who have predictably formed a Facebook group called BSU students against UNH’s blue field! C’mon BSU, don’t you know even Chargers get the blues? 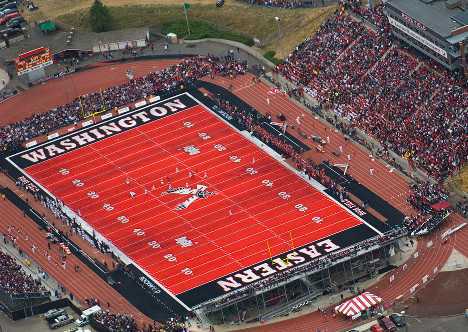 Perhaps the most publicized of the new crop of colorful football fields is Roos Field at Eastern Washington University. 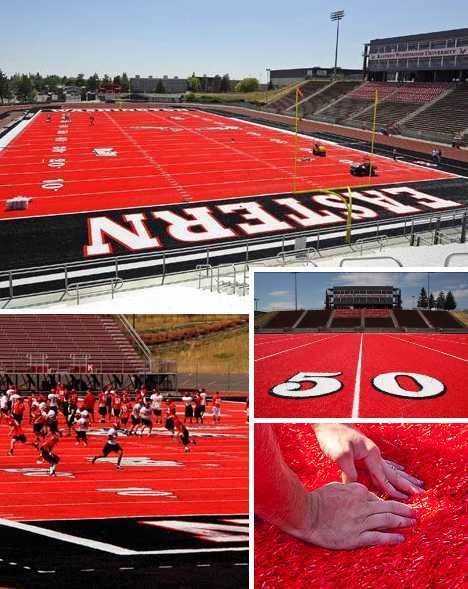 The intense red “lava” turf was inspired by BSU’s blue-turfed Bronco Stadium and some say the choice of color is a thinly veiled grab at the spotlight. Defenders of the crimson carpet, on the other hand, merely state that the turf and its black end zones match EWU’s school colors. 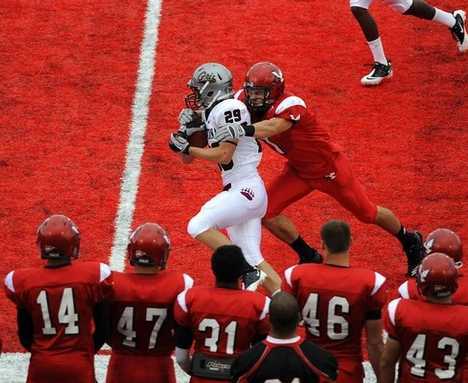 This isn’t always a good thing – one wonders if trying to pick out a red-clad receiver sprinting downfield on the red turf causes EWU quarterbacks visual difficulties. As well, some commenters have speculated on whether several years of sunlight and UV rays will cause the intense red turf to fade to pretty pale pink. 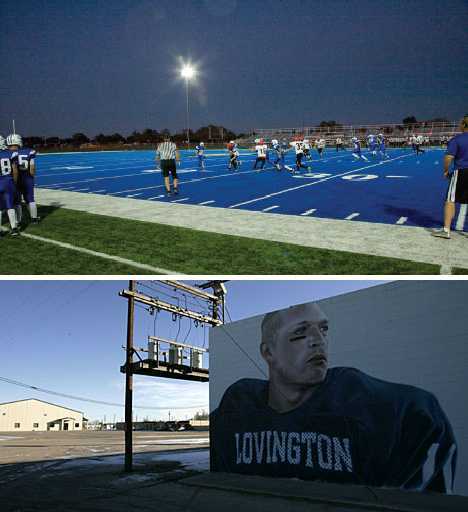 In Lovington, New Mexico, players and fans are lovin’ the high school’s cool blue football field. The hometown Wildcats play at a 6,000 seat stadium that’s almost always packed to capacity for Friday night games – this, in a town with a population of just 9,600. Lovington boasts a notable alumnus in Chicago Bears linebacker Brian Urlacher, who played for the Lovington Wildcats from 1993 through 1995. Urlacher’s number 11 has been retired by the Wildcats and he has made a number of generous donations to the school’s athletic program over the years. 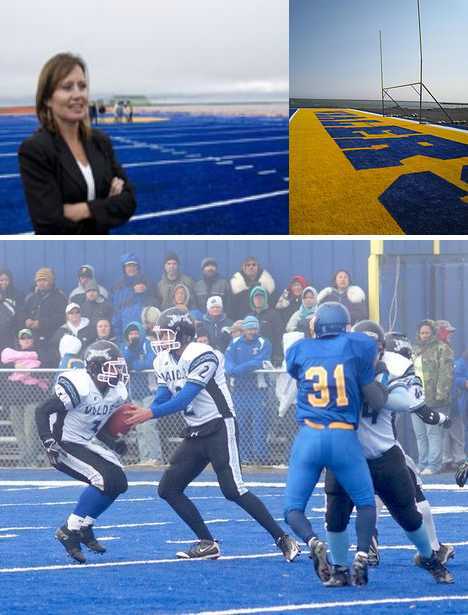 Things are somewhat more civilized now for the Barrow High Whalers now that they have beautiful blue Cathy Parker Field to play on, never mind that a hooked punt could easily land in the Arctic Ocean just a few dozen yards past the sidelines. The field, resplendent in deep sea blue with bright gold trim, complements the uniforms of the Barrow High Whalers. Why blue? Why not? A green football field at 71 degrees 18 minutes north latitude would look even more out of place. Here’s Cathy Parker Field as seen from a passing airplane; or perhaps a roving Russian Bear bomber. Summers in Barrow can be downright temperate and as for field lighting, who needs it when the sun doesn’t set for weeks on end? 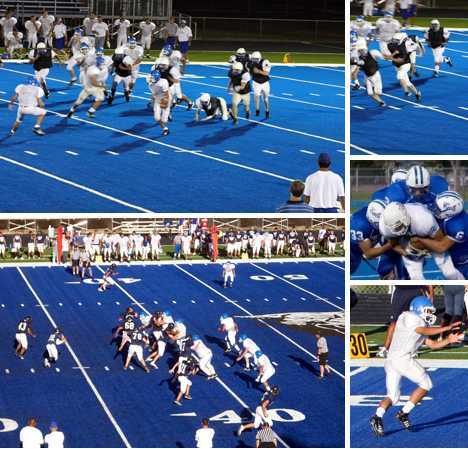 Are there any limits to what color an artificial turf playing field can be? Only those imposed by governing bodies like the NCAA and the NFL. 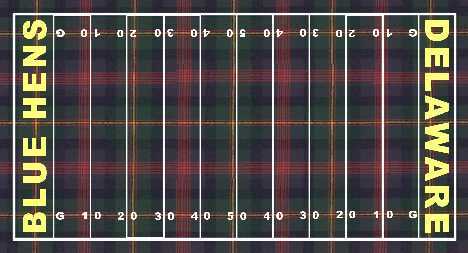 Since the turf is artificial, it can be made to order in any color – or combination of colors – the customer desires, even if the results look, er, ludicrous.